When military institutions intervene in debates about integration, social cohesion and now, radicalisation, they overstep their bounds. Credit: Vron Ware. All rights reserved.Throughout the week of September 15-18, London is hosting “the world’s leading defence and security event” organised by DSEI at the Excel Centre in Docklands. The occasion will allow “the entire defence and security industry to source the latest equipment and systems, develop international relationships, and generate new business opportunities”. 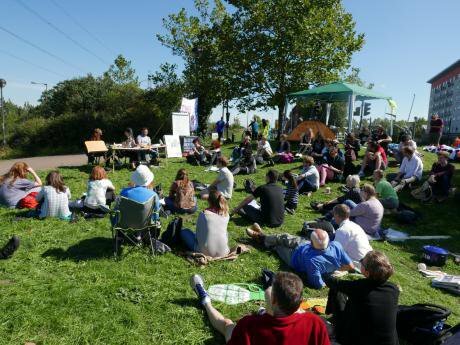 For seven days preceding the opening, members and supporters of the Campaign Against the Arms Trade held numerous events and actions to educate, blockade and protest. 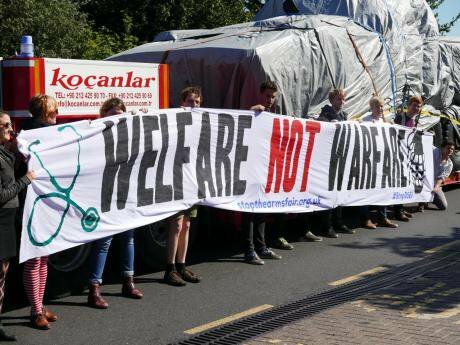 These valiant efforts will continue to shine a spotlight on the obscenity, hypocrisy and venality of governments and corporations involved in the global arms industry, long after the fair has left town. It may not be possible to obstruct the event itself, but their actions make it hard to ignore the extent to which the UK government is a leading player in this market for state-of-the-art surveillance, coercion and killing machines. Taking part in an academic-style conference held on the grass outside the gates of the exhibition centre, I decided to talk about who is going to use these weapons and to ask questions abut how they are recruited. How are young people, whether male or female, enticed, compelled or persuaded to use weapons that kill, maim, torture and traumatise other human beings? How are we to analyse the social institutions that support and sustain professions of lethal violence, an act that is prohibited by law in normal society? How, in our educational work against militarism and the state’s constant preparation for war, do we hold military organisations to account? How do we monitor their attempts to normalise military work as a profession like any other, and how are we to challenge that deep-seated idea, so fundamental to nationalism, that military service confers the ultimate seal of citizenship, the right to belong in this country? Of course these are questions that resonate differently in different societies, depending on historical context, for example, or whether there is conscription and other ways of coercing young people to train as soldiers. Credit: Vron Ware. All rights reserved.In the UK where we are currently hosting this dreadful event, there are particular issues about race, ethnicity and military service – in common with other European societies – that arise from Britain’s imperial past. How does that historical legacy surface in today’s calculations about recruitment to the armed forces? How does militarism come to saturate a multicultural society such as this? Can diversity be militarised? There is currently a real crisis about recruitment to Britain’s armed forces. The Coalition government’s restructuring plans, announced in 2010, aimed at reducing the army to 82,000 by 2018. However, this summer it emerged that numbers had fallen well below these targets. There are many reasons for this shortfall, not least the fact that the armed forces aren’t officially fighting a war. Military organisations are in competition with other employment sectors and yet the terms and conditions are not like any other job – particularly since recruits are expected to sign up for five years when they join. According to a recent report in the Mail the navy is finding it especially hard to attract applicants. ‘Youngsters’ are reluctant to commit to a job that would require them to spend time under water for significant periods as they wouldn't have access to Facebook. ‘Youngsters’ are reluctant to commit to a job that would require them to spend time under water for significant periods as they wouldn't have access to Facebook. Having contracted out the recruitment process to Capita two years ago, it recently launched a rebranding campaign after a survey by OnePoll found that 25% of those aged between 18 and 34 believed the army was less relevant now than ever before. The aim of the exercise is to show how modern and dynamic the armed forces are, particularly the army, which is the largest of the three services. They are quite clear about what they need to do: increase the numbers of women and ethnic minorities. But in demographic terms, they have no choice. The proportion of ethnic minority citizens is rising in the age group most attractive to armed forces: 16-25 year olds. They need those young strong bodies. This crisis in recruitment and need for BMEs isn’t new in itself. The recent history of modernisation really began in the late 1990s, when their employment practices fell foul of the Race Relations Act. Kicking and screaming, the institution was forced to make changes after New Labour came to power: women were incorporated into the services, gays were allowed to serve openly, non-Christian chaplains were appointed and Commonwealth citizens were admitted to deal with the deficit of ethnic minorities. These developments were largely mandated by legal obligations to submit to new equality and diversity standards, which included the attempt to represent society in terms of ethnic diversity and faith. That process has progressed unevenly, mostly unseen, and in some ways is comparable to the reform of the police and prison service. A look at a recent PR announcement suggests that the army continues to take this seriously. Earlier this month the Telegraph ran an article about a new leadership code to be unveiled at Sandhurst by the The Chief of the General Staff, Gen Sir Nick Carter. Its aim was to make the Army more “inclusive” and a “modern employer” as it tries to recruit more women and ethnic minorities. “When building tightly knit teams it is important to acknowledge the need for mutual respect and the requirement to avoid conduct that offends others.” Fair enough. However, as often happens with the British Army, it’s one step forward and two steps back, especially with reinforcements from their friends in the old guard. The article, headlined “Army 'must not lose banter' in harassment crackdown”, then quoted from a ‘top’ sergeant major who said that this sort of thing was in danger of turning it into a sterile and humourless place which was against the whole spirit of the army. The article, headlined “Army 'must not lose banter' in harassment crackdown”, then quoted from a ‘top’ sergeant major who said that this sort of thing was in danger of turning it into a sterile and humourless place which was against the whole spirit of the army. “Other places can be like that, but not the Army.” Not when you are fighting the forces of political correctness from the rear. So what does it mean to say that multiculture is being militarised? Diversity discourse is used, not just to persuade potential recruits and their families that the army is modern and progressive, and therefore likely to be used in operations that are justifiable and honourable; diversity talk can also make ethnicity and religion meaningful in relation to war work. It may seem obvious to remind ourselves that war routinely fixes and reifies ethnic and national identities. This has implications for how we think about recruitment as well. When we see that military recruiters are targeting young Muslims and young Sikhs, appealing directly to their ethnic and cultural identities, we should be suspicious. So, for example, earlier this year there was an announcement that they were going to have a recruitment drive to increase the number of young BME Brits. Figures were released to show that there were “only” 480 Muslims in the army, out of a total of 88,500. Army chiefs acknowledged this was not good enough. Press coverage revealed that the army had been “trying to engage with communities in places such as Bradford and Burnley, where Muslims account for about 25% and 10% of the population respectively”. Of course the army is not on its own in this campaign either. They have back up from the corporate media with headlines like: “The British Army launches drive to recruit more Muslims”. Anecdotes about discovering the happy overlap between military values and Muslim ones were wheeled out demonstrating how that the security services were perfectly able to embrace the rubric of equality and diversity for their own strategic purposes. But the media went beyond an endorsement of the need to diversify: the Times announced: ‘Army fights on the home front for Muslim recruits’. A front page report in the Independent spelled it out: “The British Army is making a determined push to recruit Muslims in an attempt to counter the rise in radicalisation which has seen hundreds of young men from this country join violent extremist groups like Isis and al-Shabaab”. Both the Telegraph and the Mail reiterated the line that there were more Muslims leaving the country to join Isis than there were in the forces: “Army drive for more Muslims after Paris massacre and rise of Islamic State as it’s revealed just 480 are currently serving”. Meanwhile the Telegraph reported that the army chiefs were seriously considering the feasibility of a Sikh unit, an idea that clearly harks back to the Raj but refuses to die: “a new Sikh unit would allow the common ethos essential to seeing strong fighting spirit develop”. We can dismiss this as residual sparks of a colonial mentality. But when military institutions intervene in debates about integration, social cohesion and now, radicalisation, they overstep their bounds. Diversity is further militarised when the public accepts that the army has a role in preventing radicalization at home. The implication is that Britain’s armies were composed of thousands of men who were blood brothers under the skin, all fighting for the same cause – Britain’s freedom. In this official rhetoric, Britain’s multicultural society was forged in the trenches, deserts and jungles, a scenario that US anthropologist John Kelly calls “the theatrics of blood”. The claim that ‘they’ came to Britain’s aid in ‘our’ hour of need entrenches the out-dated principle that military service is the fundamental qualification for citizenship today. This is not to play down the significance of the belated recognition being given to the performance of colonial troops in WW1 and WW2. It can only be positive to deepen all young people’s knowledge of this history. More importantly it can reinforce the right to belong for many who had no idea that their forebears were so deeply entangled in the making of Britain, and therefore help them understand their place in the world. However, unless we radically question the way this is done, the commemoration of war can simply compound the militarisation of diversity discourse. It projects the fantasy that cultural diversity is a global project with military origins and promotes the idea that the world’s complex geopolitical problems can only be solved by military might. The commemoration of WW1 as a historic event in which Commonwealth countries ‘contributed’ manpower, resources and lifeblood, routinely obscures the deeper explanations of how those armies were assembled and organised. It both sanctifies and sanitises the historical record of colonial violence and the way in which European empires carved up large sections of the world between them. Meanwhile it’s the grim legacies of those histories that we are witnessing now, whether in the trading pits of Docklands exhibition centre or in the flood of human misery shaming Europe’s politicians. 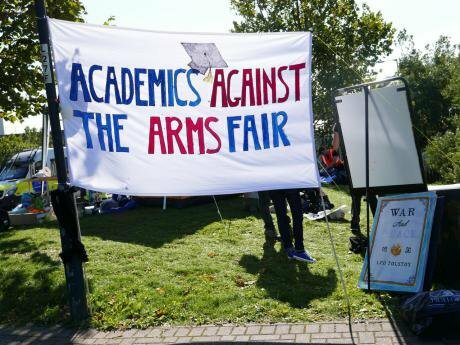 Thanks to StoptheArmsFair.org for organising the Academic Conference at the Gates on September 10, 2015.